Take Shaun T's 60-Day MAX OUT Challenge and get ready for new moves and new sequences designed to shatter your limits. The goal in INSANITY MAX:30 is to work to your max in every move and every minute, so you can torch MAX calories, burn MAX fat, and achieve MAX muscle definition. It's a battle between your body and your mind to see how far you're willing to go for insane results. Yes, it's crazy hard, but it's only 30 minutes. 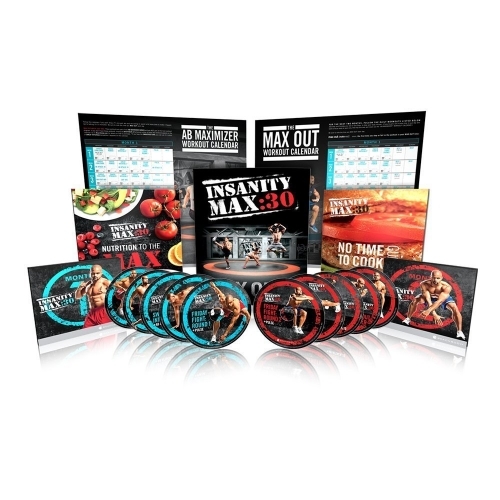 INSANITY MAX:30 includes 12 workouts on 10 DVDs, MAX OUT Guide, Nutrition to the MAX, MAX OUT Workout Calendar, AB MAXIMIZER Workout Calendar, and No Time to Cook Guide. •Cardio Challenge: 30 minutes of the hardest cardio sequences you've ever tried, designed to push your body to the MAX. •Tabata Power: Your strength training starts here with a traditional Tabata-style "20 seconds on, 10 seconds off" workout structure. •Sweat Intervals: 30 minutes of screaming, sweating, calorie scorching madness. •Tabata Strength: Shaun T takes it up a notch (or two) in this NO REST, Tabata-style workout. •Friday Fight: Round 1: This workout will be a battle between your mind and your body and this is just Round 1. •Max Out Cardio: This may be the craziest cardio workout you've ever tried. Just wait till you get to the first Power Move. •Max Out Power: The intervals are longer in this "45 seconds on, 15 seconds off" Tabata-style plyometric power madness. •Max Out Sweat: The more minutes you make it through, the more you SWEAT and the more calories you burn. You'll know why we say "twice the sweat in half the time" after this workout. •Max Out Strength: Max strength and max fat burn are what you'll get from this "45 seconds on, 15 seconds off" Tabata-style routine. Your arms, shoulders, chest and core will be toast after this workout. •Friday Fight: Round 2: The hardest workout ever created. Every move is a minute in this final fight between your body and your mind. Who's going to win? •Pulse - Shaun T's version of a recovery workout, this is a low-impact combo of stretching and small "pulsing" movements that'll definitely make you feel the burn. •Ab Attack:10 - This 10-minute routine will feel like an attack on your abs, but you'll love the rock-hard results. This Product was added to our catalogue on Monday 05 September, 2016.